What do you do when you are not at Mi5? 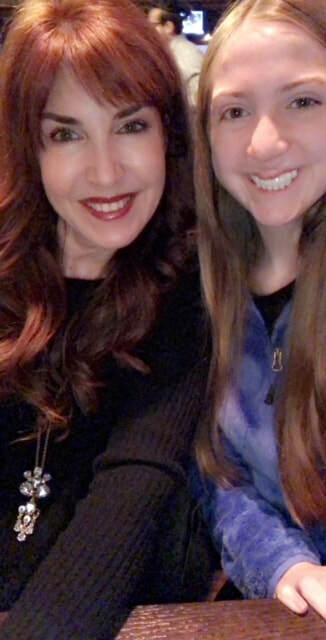 • My favorite hobby is raising my 16 year-old daughter, Emilie to be strong & walk in good faith! • Faith...I have to work on that daily. • Work... certified 3:30am(ish) early riser. I am a Sr. Human Capital Management Strategist at ADP; been with them for 8 years. I am a work-a-holic; albeit, I do love my job and helping my clients thrive is something I’m very passionate about. • Drove by on the freeway, saw the sign, and thought... “Holy crap, I have been needing something new and exciting in my life and this place is it!” Never looked back. • Honestly, right away. I’m the type of person who is extremely self-motivated, but humbly admit that I require the direction. I need to be pushed when it comes to wellness & fitness. In addition, I have been blessed with the most amazing “family” and friends on earth within the walls of Mi5. I couldn’t imagine my life without this community... I’m a better human because of this gym. Period. •Some people do know this, but my daughter and I lost our home (and literally everything in it) to a fire in 2010. We had to start from square one with absolutely nothing. It’s when you truly have nothing, that you realize that you actually have everything... my heart grew 1,000 sizes that year, and I learned that so many people are so incredibly “good” in this universe. •Be bold & brave. They always say the first step is the most difficult, but you have to take it in order to experience it. Know that you have a community of humans in this gym, who also “just started” themselves at one point. We may not all be the strongest in the same movements, but we all have kindness & bravery in common, which is all you need. Just put one foot in the door...and never look back. I am a Subject Matter Expert in the legal field specializing in Computer Forensics and eDiscovery. In my free time I enjoy golf, running, hunting, traveling, and shooting trap. My first day when Angie called me ****stick. I knew these were my people. I look forward to "The Murph" each year. 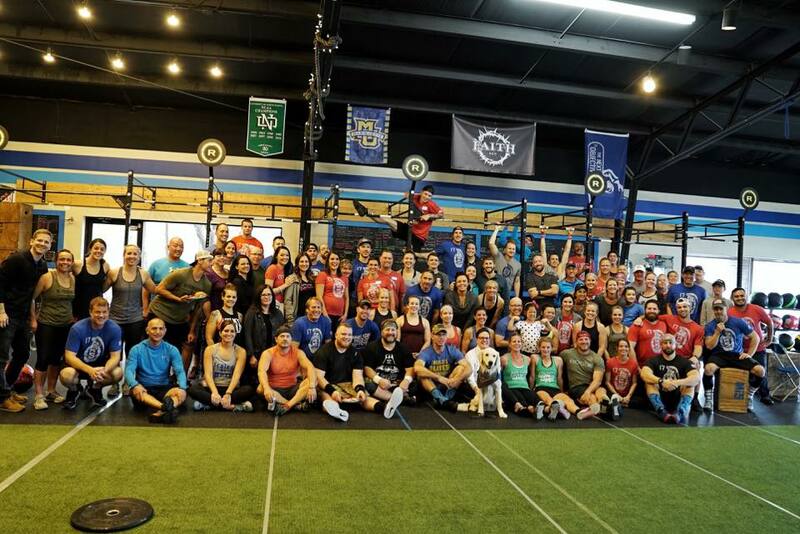 While it is certainly a challenge, I love everyone coming together doing the same WOD to honor Lt. Michael Murphy. I have gained strength in my core allowing me to hit the golf ball much further. I never thought would be able to hit the yardages that I can now, and I attribute that to Mi5. What advice would you give to someone just getting started at Mi5? The same advice that I received when I started. Go to BootCamp classes and learn the movements (also meeting tons of people) at lighter weights. I'm retired. The few hours I'm not at MI5 doing Boot Camp, Boxing, and Yoga are spend investing in stocks and options, big mountain downhill skiing out West, and cooking. A former trainer, Matt Strand. Instantly, never a doubt after the first workout. Exhausted, sore, and couldn't wait to go back. Murph: 1600 meter row, 100 pull ups, 200 push ups, 300 air squats, 1600 meter row. 20 minute AMRAP of "Spicy" Cindy: 5 pull ups, 10 push ups, 15 air squats, 20 sit ups, 15 heavy KB deadlifts, 10 heavy kettle bell swings, 5 heavy bicep curls. Pick one: Handstands, 335 lb dead lift, 25 pull ups, 30" box jump. Being able to live life on my terms with no constraints. I plan on entering the Minnesota Senior Olympics this summer and winning the 50 meter dash. ​I was the very first Mi5 Member so Aug (or September) 2012? I trained with Chris and Andrew at their previous location. 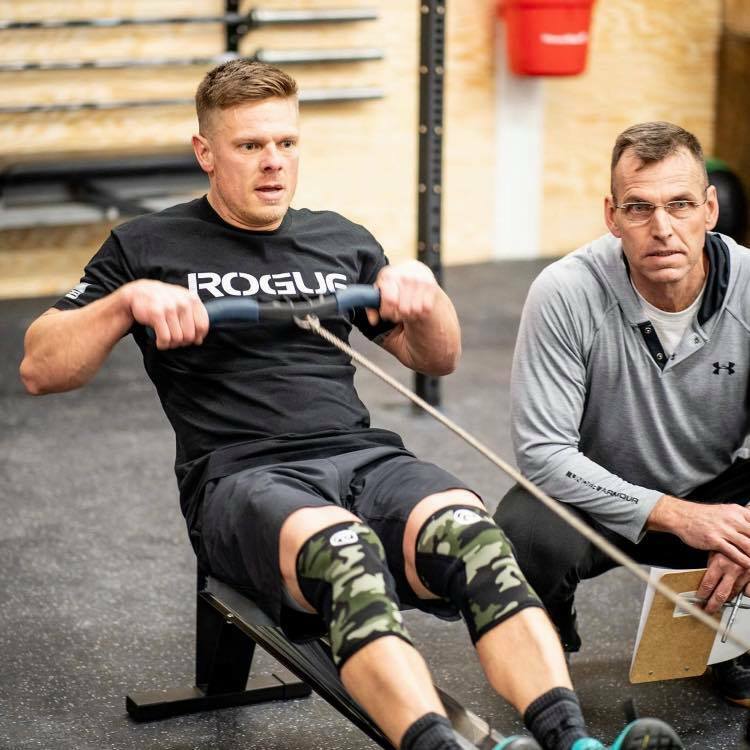 I loved training with both Chris and Andrew so I never questioned whether Crossfit/Mi5 would be a good fit for me. I would have followed them to any gym whether it had the Crossfit name or not. I stay because Mi5 has the best trainers who show up every day to help others do better and be better. Their gym community not only supports, encourages, and motivates you through a challenging WOD, but also life outside of the gym as well. I love a WOD that is at least 20 minutes, has at least 3 different movements and that is cardio based. What is one thing you have been able to accomplish since starting at Mi5 that you never thought you’d be able to do? Considering one of my high school coaches came into the weight room and said, “Ms. Lockrem, laying on the equipment does not count as lifting the equipment”. I think that every time I finish a WOD I have accomplished something that I never thought I would be able to do or I should say want to do. I painted the inside of that gym (the blue wall ball lines are mine), took down walls, scraped glue off the floor in 100 degree heat with no air, and when I was done Chris G. told me I was a horrible painter. Lots of places! I am a navy brat and grew up across the country and eventually landed in Minnesota. I am a partner at Barnes & Thornburg, LLP in the Minneapolis office. My practice is focused on intellectual property law: the protection of ideas and brands, both inside and outside the courtroom. In my “spare time,” I am blessed with six children, an awesome husband and a really awesome washer and dryer set. I also love the outdoors and everything you can do in it! And of course....there’s Crossfit. The amazing sign outside drew me in! Right away! The people are truly kind and welcoming. ​Running and running and running. With deadlifts. It just feels great to be fit! I bake an exceptional pecan pie. Jump in and don’t be afraid to try new things. It’s ok to be the last one to finish! Everyone is there to encourage you to be the best you, and that’s what matters. ​When did you become a member of Mi5 Fitness? I enrolled in the Kick Start program in January 2017 and then officially became a member in April 2017. I’m a contract accountant specializing in assisting entrepreneurs and small/medium businesses with their accounting needs. Outside of work, I love spending time with my family - Scott, Allie and Rachel – all of whom are regulars/drop-ins at the gym. Rain or shine, I walk our golden-doodle, Winston, every morning and my happy place is our cabin in Turtle Lake, WI. Jodi Dobratz invited me to join her for the Kick Start Program. I’d always been “active”, but I needed help to “step up my game” and someone to hold me accountable. The coaches and community at Mi5 do that for me in a positive way. I don’t have to plan my workouts. I simply show up and am encouraged to push myself harder and lift heavier weights than I’d ever do on my own. In addition, Mi5 coaches take the time to discuss nutrition and provide suggestions on ways to change my eating habits so I fuel my body properly both pre & post-workout. Finally, the atmosphere at Mi5 is welcoming regardless of ability level. The coaches and other members “met me where I’m at” without judgment and make the effort to get to know me personally so I feel like a valued member of the Mi5 family. I’d say M15 offers the complete fitness package. A chipper with a mix of strength and cardio. I don’t despise the rope climb as much as I used to, but I do sigh each time I see it on the WOD. Anything outside as long as the temperature is above 60 degrees! Running a 5K was never on my bucket list, but I felt an awesome sense of accomplishment when I completed my first one. Since then, I even joined my family in a 5K Turkey Trot last Thanksgiving and I’m signed up for the Rugged Maniac this September with a bunch of other Mi5ers! I’ve never had any health/fitness issues (knock on wood), but turning 50 made me seriously consider how I was going to be proactive and take care of myself. Long ago, I traveled to Russia for work with $10,000 in cash strapped to my waist. If you commit to working hard 3-4 days per week with a bunch of pretty awesome people and are open to evaluating your eating and driving habits, you'll see results!" I live close by and saw the Mi5 CrossFit Lakeville sign. I looked them up online and stopped in for a free class. I wasn’t sure after my first class - I only made it half way through my first CrossFit class. Andrew called me after the class and suggested I start with some Boot Camp classes. It just felt right after that. The friends I have made and the encouragement they give me is unbelievable. I have 2 daughters, I want them to know that you can do anything at any age. I don’t cook much (no surprise to anyone) but I make really good homemade spaghetti sauce – thanks to my Italian grandparents. Stick with it, you won’t be disappointed! I've being coming solid for 2 to 2.5 years, but was on and off for a while before that. I'm a tile setter. I also shoot shotgun, mountain bike, play/hunt with my dogs. I called Andrew's Liftetime Fitness business card. Andrew actually trained me 15 years ago. I tried going back to lifetime on my own, but couldn't stick with it, so I called Andrew up and he said he'd just opened a new gym. He's been a huge help in my life. When/How did you realize Mi5 was the right fit for you? I knew it was the right fit because of my mental gains. I was struggling with depression and nonmovement, and Mi5 has helped changed it. My favorite are the chipper style workouts. Show up, and take it one day at a time. Trust that progress will be made.